If you are considering traveling abroad for weight loss surgery you need to know that this choice is a taking a huge risk on both your health and your finanances. In the long run, deciding to have your weight loss surgery performed abroad can be both medically and financially disastrous. 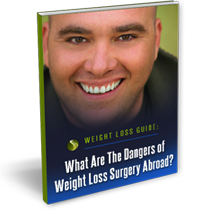 What are the financial damages of having weight loss surgery abroad? What are the health risks of medical tourism for weight loss surgery? Before you decide to travel for weight loss surgery, let Riverside Surgical and Weight Loss Center help you weigh the pros and cons of all of your weight loss surgery options. You may be surprised to discover that the best option for your health and wallet is closer than you think!